Here it is! The latest and greatest from Google - rolling out the Pixel 3 for a sizable sum of cash. This needs to be put up front really and the following digested in the context of that. The 64GB version is £739 and 128GB, £839. That's a lot of cash in my book. A lot of cash that would buy an awful lot of smartphone elsewhere. But, OK - let's approach it with an open mind and be prepared to have our socks blown off in the usual way, particularly by the special unique features that Pixels bring to the table. The first thing to be said is that this is the younger brother of the 3XL, as has become the norm for Pixel releases, and I don't have a 3XL here to compare it with, neither have I even held or seen one in the flesh, so to speak! As I have previously reported, I always felt that there was something about the 'mass' of the 2XL which made me keep trying it and giving up - and something about the size, not 'mass' of the 2 which did the opposite. One felt too big, the other, too small. I approach this increased size 'little brother' with optimism. And the second thing to say is that, having now unpacked it, it looks and seems pretty much as small as the Pixel 2. I can't help thinking that it's just too small still, even though I accept that there's a screen increase which should make it feel bigger. I've been able to copy across by cable in the usual Pixel Perfect way, all the data to get going right away from my Nokia 8 Sirocco - and whilst they are next to each other on my desk, I think that the Sirocco, for me anyway, is what this Pixel is going to be up against during my voyage of discovery. While that's going on, a peek in the box reveals the usual range of accessories including a USB-C to USB-C cable, USB-C to USB-A adapter, a 3.5mm to USB-C dongle, power brick and a pair of earphones that are outer-style, which for once, I might actually use! I can't stand these in-ear ones! The bit that sits on one's outer-ear looks very Apple and half way down the cable is a control nobule, which I'll test in due course. The process took 8 minutes, with 35GB of data coming across, magically turned into 25GB! This is because, whilst the Sirocco was hogging 12GB of it for the System, the Pixel is amazingly only using 1.1GB, though I do accept that this will start to get eaten more as I use it (36 hours later, sure enough, it's 8.7GB). I must admit to being shocked at myself for failing to take into account this factor during my recent deliberations on whether or not I could live with a 64GB phone with no microSD Card slot for expansion (https://goo.gl/ycQ1Wi) the assessment of which has taken an upward turn! As an aside, I did plug in a microSD Card to the supplied adapter, then via a microUSB to USB-A adapter(!) and the phone used the data on the card, no problem, so one could argue that for very occasional use, that could be a workaround. September security was present when I fired it up and this was update straight away to November (it's now 9th as I write), so not sure what happened to October! The phone already knows my voice, so no need to train it for that, as it does my bank card - though registration with the bank is (reassuringly) still needed. The homescreen layout, pages, folders and widgets didn't make it across, but that might have been a tall order across OS versions and OS flavours (8.1 to 9 and Android to AndroidOne). Talking of the homescreen, the Pixel remains annoyingly inflexible on the first homescreen having screen elements unmovable and unremovable, Google Search Bar at the foot and clock/weather and Notification widget up top. I have a calendar widget that I've used since 1842 which I simply can't put on my homescreen. The screen is too small to see enough of it and shrinking its text makes it unreadable. Maybe the 3XL would be better. This is exactly what Android was supposed not to be! The setup process is incredibly fast and sweet. Not quite Apple yet, but certainly heading the right way. Still stuff to sign into but with Auto-fill and Smart Lock to assist it's far from the painful and half-day process of yesteryear using Android. So, screens all set up, apps all signed in and we're ready to go. I now head towards the broader questions of whether it's worth the money by picking apart some of the stuff you get with a Pixel that you don't with a Nokia. A good starting point would be the Snapdragon 845 (P3) against 835 chipset (N8S). I can't really believe that without heading to testbenches this would make any difference to the average non-gaming user. Both devices fly through any task thrown at them, as they do during multitasking, even though the N8S has 6GB RAM over the P3's 4GB. Insignificant. As is the difference between the Nokia's IP67 and Pixel's 68. Both perfectly good enough. Not that I tested either! Photography is an area where I know that Google excels via software and for the pixel-peeper, it's clearly going to be streets ahead of the Nokia. However, for the man in the street, the Nokia is perfectly fine for that oft' quoted generalisation here - more than good enough for 90% of people to do 90% of the stuff they're going to do with it. You could argue that there are more bells and whistles, toys to play with on the Nokia than on the Pixel, but you can't argue with results. The camera is a 12.2MP f/1.8 unit, for the record, with OIS, partnered by two Selfie shooters on the front, one 8MP f1.8 and the other 8MP f2.2 wide-angle which can be zoomed with a slider to get everyone into shot down the pub! Littered all over the internet is test after test which clearly shows that Google has become very clever here with excellent photography, especially in low light, even if the Nokia has a 2x zoom, 2 lenses and the Pixel has OIS to differentiate. Being unqualified/uninterested enough to take this further, I'll point you to Steve Litchfield's video appraisal at this point, to see a breakdown and close analysis (https://goo.gl/KB95WT). The Pixel is running stock Android, as we know, and the Nokia is utilising the AndroidOne experience. We know that this means the Pixel will always be close to the beating heart of what Google are doing, Security Updates first and OS iterations straight from the core. Whatever Nokia and/or Google claim about AndroidOne, the Nokia 8 Sirocco is still on Android Oreo 8.1 with October 2018 Security (yes, of course, it could be much worse) whilst the Pixel is bang up to date. The promises that the AndroidOne experience would be timely and next to Pixel itself, though very good compared to most, isn't quite that. But we're being picky now. Now we come to my favourite topic - sound! The Sirocco has a fairly decent enough bottom-firing mono speaker which sounds fine for most uses. It can feel tinny at the top end sometimes and there's not much bass to speak of, but sitting in the middle there, perfectly good enough for that 90% of folk again. Whereas, the Pixel has (kind of) stereo speakers. Not quite the front-firing 'real' stereo speakers of the Pixel 2, but rather this kind of faux stereo using the chin's front-firing speaker for the lower frequencies and the forehead's front-facing speaker where the earpiece for calls is, obviously at the other end of the unit, for the mid/highs. I've always said that in a device this small it doesn't matter about stereo. It doesn't matter where the sound comes from to a degree, but what's important is the overall sound experience. So how is it? Testing this against the Sirocco is not really a fair match, the Pixel being streets ahead in overall quality and volume, so I turn to my trust Razer Phone to raise the challenge. May seem a bit unfair the other way, but let's see! Using the same YouTube videos on both devices, firstly with the Razer's Dolby Atmos off, then on. The Pixel 3 has no 'global' sound control - what you get is what you get without using apps' internal controls. The first test reveals that the Pixel is just as loud as the Razer but slightly less rich and qualitative. The second test reveals that the Pixel remains slightly louder, but that the Razer, Dolby in full flow, blows the Pixel away for quality, richness, bass, depth and enjoyment. As always, all of this depends on what you're listening to and which app it's being served up from, but that's the overview. On listening to music, the same track, same 320kbps .mp3 file, pure piano, nothing else, I did indeed detect some distortion at full volume on the Pixel, but not anything on the Razer. It's tempting to think better of the Pixel as it's such a more practical device to carry around over the Razer and is so much more capable in many other ways, but I'm trying here to be objective on what my ears hear. Maybe the test is, as I say, unfair. Perhaps a better test would have been against an iPhone X or Samsung Galaxy Note 9, but sadly I don't have them here now. From memory, I would say that the Samsung models that have been here lately were very similarly sounding to the Pixel. Some of these top-end manufacturers seem to, at last, be taking this seriously and nobody could complain about the speaker-sound experience on display here. I'm just nit-picking. But while I'm doing so, the Razer is still King! As my research had suggested, of course HDMI-out doesn't work, so no way to get content stored on the device onto the TV with a cable. Inevitable really as Google want to encourage people to be online, not encourage them off. It's a great shame that this option is disappearing with all other port-served functionality in lieu of wireless everything, assumed connected at all times and being able to afford to stream. Kudos to Samsung, LG et al for keeping this going. Even my Sirocco will do this! As I consider headphone output, I'm beginning to wonder why I started out comparing this Pixel 3 with the Sirocco! I'll get back to it - it's the physical really. As for headphones output, the Pixel comes with a DAC dongle so you can plug in your old 3.5mm headphones and they sound great doing that, but the system takes a step up when (in terms of functionality) you put in the supplied USB-C Buds. The controller in-line although feeling quite old-fashioned now, hooks the user up to the Google Assistant and if you let Google do it, will alert you to notifications and read them out to you. Having said that, I've yet to get it to work! It's supposed to emit a beep when something comes in, then you press the button in-line if you want to hear it. I heard the beep during setup, but never again! Probably a setting somewhere which needs throwing. Incidentally, this Bud set works perfectly on the Sirocco, too, controlling the Assistant and volume up/down pause/skip/play, so that's good. Leaping from pillar to post, I'll now consider the screen. I'm not really interested in benchmarks, rather using my eyes to judge, for my use. It's a bright, but far from the brightest, P-OLED 1080p panel, flat, and 5.5" diagonal. I think it's very very slightly brighter than the Sirocco's screen and Razer's LCD but not as bright as the Moto Z3 Play's. Colours are rich but saturation controlled. Adjusting the minimal controls in Settings doesn't really seem to make much difference. They've done the now common thing of 'rounding' the corners of the panel so that it's in keeping with the curves of the corners of the device itself, for no other purpose. A square-cornered viewing panel is very clearly more logical, but they've gone the way of the pack. The panel doesn't quite get to the top or bottom to leave room for the front-facing speakers, which some consider to make it look unbalanced, with chin and forehead. The always-on screen is a clear bonus over many other phones still in 2018, though the display is not as bright and big as it is on the Sirocco. 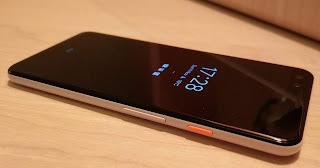 Neither phone really have very much direct interactivity with the notification items without moving through to the next screen, when locked, unlike Samsung, LG and Moto for example, who enable direct actions (which don't time out or go away if you miss them when they first pop up). What you do get is some colour, but more importantly Now Playing. This is a fabulous toy to have available and to play with, whereby the phone always listens to what's going on around it, detects music playing, then tells you what it is, giving you links to other services if you want to follow them, options to buy or download, history list of what your phone's been listening to, and so forth. It's great fun and very handy, though not really a killer feature for everyone. How it does this, offline, seems like black magic! They've pretty much made the device the same size as the 2 by doing the usual 18:9 screen thing, though have steered clear of the Notch Lunacy, unlike on the 3XL. Some days I really like the flat panel, Razer, Moto Z-family, then other days I look at the gorgeous curves around various 'pebble' devices, Sirocco, Samsung 8/9 and the like and think that looks lovely and feels great in the hand. There's no doubt that the flat panel is much more pragmatic and aside from aesthetics and design, there's really no need for curved glass. Down the sides is the Active Edge sensors, so squeeze for Google Assistant rather than long-pressing Home, and this works well for those likely to use the feature. You can adjust the sensitivity of that and/or turn it off and/or enable it whilst the screen is locked and/or set it to silence notifications etc. with the same squeeze. Speaking of which, the front and back are glass, Gorilla Glass 5, held together by a sweeping aluminium edge. The phone could be an iPhone. It could be a Huawei. It could be an LG. Phone design is becoming more and more boring IMHO and I'm guessing, as stated in PSC472 this week (https://goo.gl/JZHSLv), I weep for the impersonalisation of design and interesting USPs, every phone the same. Compared to the Sirocco, and especially Razer, Moto Z-family, CAT S61, to mention a few, it's just boring! Unlike some others who seem to think that the lower 80% of the back of the phone is 'grippy' I disagree. It might not be shiny and slippery, but there's no way the slightly textured back means that the user wouldn't need at least a TPU case. In actual fact, for those who have this phone in-hand, lay it face down, then run a finger from bottom to top on the back and you'll see that actually, the so-called more grippy 80% is more slippery than the top 20%. Ha! The back also houses the same-looking fingerprint scanner of the previous version, in the same place, works excellently, registration and in use, though why they haven't got onboard with face recognition by now, I don't know. Now that is a 'modern' feature worth having! USB-C port is on the bottom and also SIM Tray (e-SIM ready). This Clearly White model has a bright orange power button on the right, above a volume rocker. All plastic, but very clicky and solid-feeling. The power button brings up the Power Off, Restart and Screenshot options with a long-press, short press kills the screen light and double-press, the camera. The volume rocker brings up a slider on-screen, with handy taps for quick access to Mute/vibrate control and direct route to all the volume sliders. It's well thought out, as is a lot of stuff in the latest iteration of Android, 9. Pie. Android 9, Pie, of course brings all sorts of changes, improvements and benefits to the Pixel owner, which would take an awful lot of time to go through, but some of the highlights for me are certainly the Adaptive Brightness and Battery. The auto-brightness, to be honest, I almost always turn off, but since Pie it's a different proposition. It really does seem to learn from the users' 'corrections' over time, making it a useful tool rather than a pain, getting it wrong. This helps also for battery. The battery, on the face of it, just shy of 3000mAh, is not a powerhouse by any stretch. Adaptive battery, like the brightness, learns the user's patterns of use, app use, what background updating is important and what can wait until you next start using the phone. I have found initially that the delay on notifications can be annoying during the period of learning, but it will learn. 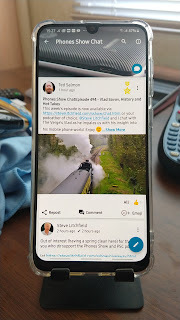 A simple example being that I want Google Plus notifications coming in all the time, MeWe the same, Hangouts likewise - but News or IMDb can wait until I next fire it up. So in theory, it learns that based on my usage. Like it learns when I'm most likely to offer it a charger and adjust battery management accordingly. Personally, I'm not confident about that battery being big enough compared to other devices out there. We're routinely heading up to 4000mAh now and I would certainly have traded dimensions for more, even if only for peace of mind. I haven't had, nor will I have this phone long enough to test this properly, so can only report what others have found - that it does indeed need more and relies on top-ups and fast boosting. I don't see a setting anywhere like you'd get in a Samsung device for example, to exempt certains Apps from that. In Settings for individual apps there's 'background restriction' settings, I thought would do this, but it doesn't seem to. Looks like you're in the hands of Adaptive Battery trusting Auto or you're not. The unit is also the first Pixel to come with Qi charging and that works perfectly, as you'd expect, manually assisting power with top-ups. There's also a fast charger in the box, so options. The Homescreen Navigation control is the Pie version of course, and I have gone on record as saying that I don't particularly like this - and that Moto does it better! Unlike other systems, you can't change this. Like it or lump it! Don't get me wrong, it's very functional with the slide-pause-slide for apps (like an Italian footballer taking a penalty) and quick-slide for recents cards, iPhone cloned, flick-right to switch between last two apps, and I'm sure the user would get used to it, but I'd still prefer (at least the option for) the three buttons - or better still the Moto Slider! The Notification Shade drop-down has also been iOS'd with big round buttons, long-press for settings, short-press to change, blue on, grey off. I have to admit that it's attractive and intuitive in use. Much like the new colourful icons in the Settings menu. It doesn't feel like LG/Samsung cartoon-land, but more tasteful and adult. There are all sorts of new entries in the Settings, mostly auto-background stuff and evolution of previous projects. Wellbeing is one of them, keeping track of what you've been up to, telling you off if you're naughty and allegedly looking out for your health and exposure to too much screen-time! There are new gestures, seen in other phones before, but now adopted, like flip to silence, Wind Down, pacing you from being away until it's lights-out by encouraging your reduction in speed by (not so) subtle hints like turning the screen mono and heading to do-not-disturb. You don't have to enable all this of course if you want to give the Big G the Big V! All this stuff is AI-based and learning from the user. This is the direction Google has been going for years now, keeping data about you and your habits so they can sell it to others and encourage you to spend time online, pretending that they care about your health! Me? Cynical?! You can see it as Big Brother of course, or you can consider it very convenient and useful to make your life easier (nothing to hide, so might as well), like the washing machine once did. Things move on and we get closer to the world being run by robots every day. Thankfully I'll be long gone by then! Available in Clearly White, Just Black and Not Pink, it's a cute little thing which is very capable indeed. It's a clever bunch of cutting-edge tech which has, once again, learnt from other manufacturers leading the way and added features a year behind them (no doubt the Pixel 4 will have face-recognition and under-glass fingerprint scanners). The speakers sound fabulous, the camera results are clearly market-leading, however they get there, the software is second to none and developments from Google are a joy to be a part of going forward. The Pixel owner really feels that they are part of the development and evolution. So what's not to like? Well, I remain concerned about the battery but will be happy to be proved wrong on that, I do think it's just a bit too small for me (bigger could have meant more battery), I personally would like a 256GB version (or 512GB pretty please!) and then there's the last issue, from where I started, price. People Have Too Much Money! The most important factor is price, because some phones are just getting more and more expensive while others are getting cheaper. I say it again - phones that do 90% of what flagships do for a third of the price, or less. Well, maybe 80% in Pixel's case(! ), but you get the point. I still get the feeling that these devices are overpriced, not reflecting the cost of making them, R&D included, but what the market will stand. However clever this phone is, it's not worth that much money - and I find it hard to just throw the money away to have the latest and greatest, when others will do almost the same job for so much less. It's an open discussion of course, but certainly driven by how much spare cash people have got. And it seems, going from the general rise of flagship prices, that they have too much. Laying that aside and money no object, it's a great slice of tech and I'd love to have one.